This article is about the river in West Asia. For other rivers named Jordan River or River Jordan, see Jordan River (disambiguation). The Jordan River (also River Jordan; Hebrew: נְהַר הַיַּרְדֵּן‎ Nahar ha-Yarden; Arabic: نَهْر الْأُرْدُنّ‎‎ Nahr al-Urdun, Ancient Greek: Ιορδάνης, Iordànes) is a 251-kilometre (156 mi)-long river in West Asia that flows roughly north to south through the Sea of Galilee and on to the Dead Sea. Israel and the West Bank border the river to the west, while the Golan Heights and Jordan lie to its east. Both Jordan and the West Bank take their names from the river. The Jordan River has an upper course (from its sources to the Sea of Galilee) and a lower one (beyond the Sea of Galilee and down to the Dead Sea). In traditional terminology, the upper course (or most of it) is commonly referred to as passing through the "Hula Valley", and not the "upper Jordan Valley"; the Sea of Galilee through which the river passes is a separate entity; and the term Jordan Valley is reserved for the lower course. In this sense, the (actually in its entirety "lower") Jordan Valley may be separated into upper, central and lower Jordan Valley. Its section north of the Sea of Galilee (Hebrew: כנרת Kinneret, Arabic: Bohayrat Tabaraya, meaning Lake of Tiberias) is within the boundaries of Israel, and forms the western boundary of the Golan Heights. South of the lake, it forms the border between the Kingdom of Jordan (to the east), and Israel (to the west). Dan (Hebrew: דן Dan, Arabic: اللدان Leddan), a stream whose source is also at the base of Mount Hermon. A small section of the northernmost portion of the Lower Jordan, the first ca. 3-kilometre (1.9 mi) below the Sea of Galilee, has been kept pristine for baptism and local tourism. 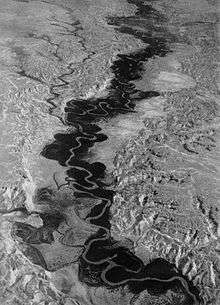 Most polluted is the 100-kilometre downstream stretch—a meandering stream from above the confluence with the Yarmouk to the Dead Sea. Environmentalists say the practice of letting sewage and brackish water flow into the river has almost destroyed its ecosystem. Rescuing the Jordan could take decades, according to environmentalists. In 2007, Friends of the Earth Middle East (FoEME) named the Jordan River as one of the world's 100 most endangered ecological sites, due in part to lack of cooperation between Israel and neighboring Arab states. The same environmentalist organization had said in a report that the Jordan River could dry up by 2011 unless the decay is stopped. The flow rate of the Jordan River once was 1.3 billion cubic metres per year; as of 2010, just 20 to 30 million cubic metres per year flow into the Dead Sea. For comparison, the total amount of desalinated water produced by Israel by 2012 was estimated to be about 500 million cubic metres per year. Jordan receives 50,000,000 cubic metres (1.8×109 cu ft) of water from the river, a quantity which is regulated by the 1994 peace treaty with Israel. This water is pumped out of the river at its exit from the Sea of Galilee and directed through a pipeline to Jordan. People generally regard June 5, 1967, as the day the Six Day War began. That is the official date, but in reality it started two and a half years earlier on the day Israel decided to act against the diversion of the Jordan River. Opposite Jericho, it was called "the Jordan of Jericho" (Numbers 34:15; 35:1). The Jordan has a number of fords, and one of them is famous as the place where many Ephraimites were slain by Jephthah (Judges 12:5–6). It seems that these are the same fords mentioned as being near Beth-barah, where Gideon lay in wait for the Midianites (Judges 7:24). In the plain of the Jordan, between Succoth and Zarthan, is the clay ground where Solomon had his brass-foundries (1 Kings 7:46). 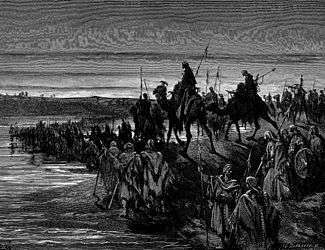 In biblical history, the Jordan appears as the scene of several miracles, the first taking place when the Jordan, near Jericho, was crossed by the Israelites under Joshua (Joshua 3:15–17). Later the two tribes and the half tribe that settled east of the Jordan built a large altar on its banks as "a witness" between them and the other tribes (Joshua 22:10, 22:26, et seq.). The Jordan was crossed by Elijah and Elisha on dry ground (2 Kings 2:8, 2:14). God thrived through Elisha performing two other miracles at the Jordan: God healed Naaman by having him bathe in its waters, and he made the axe head of one of the "children of the prophets" float, by throwing a piece of wood into the water (2 Kings 5:14; 6:6). Evidence from scriptures and archaeological findings has concluded that the site called Al-Maghtas on the Jordanian side is the most accurate location for the Baptism of Jesus and the ministry of John. This has led to choosing Al-Maghtas as a UNESCO World Heritage site, which took place in 2015. Because the Israelites made a difficult and hazardous journey from slavery in Egypt to freedom in The Promised Land, the Jordan can refer to freedom. The actual crossing is the final step of the journey, which is then complete. Because of the baptism of Jesus, water from the Jordan is employed for the christening of heirs and princes in several Christian royal houses, such as the cases of Prince George of Cambridge, Simeon of Bulgaria or James Ogilvy. 1 2 Plushnick-Masti, Ramil (10 September 2006). "Raw Sewage Taints Sacred Jordan River". The Washington Post. Retrieved 10 October 2010. ↑ "Appendix C: Historical review of the political riparian issues in the development of the Jordan River and basin management". Murakami. 1995. ↑ Kate Connolly, "Once upon a time in Bulgaria", The Guardian, 20 June 2001. Wikimedia Commons has media related to Jordan River.